Kenny Miller’s Farm Jeep Mud Truck is by far the Baddest Jeep on the Planet. This Build started with one Nasty Motor, a Jeep Tub, a pile of tubing and a dream. It features a Blown Alcohol Injected Big Block that puts out a ridiculous 2000 Horsepower. An interesting fact is that the motor doesn’t have an alternator, instead they have four Deep Cycle Gel Cell Batteries to handle cranking and running of electronics. It also does not have wheel mounted brakes. Instead the brakes are mounted to the transfer case giving them a mechanical advantage to stop the massive mud tires. The chassis was custom built around the Jeep YJ Tub out of 1.75 tubing. The whopping 2000 ponies run through a heavily built Power glide Transmission and Straight Drive Transfer Case to the Custom Hybrid 5 ton Rockwell Axles that turn the massive 64″ Rice and Cane Paddle Tires on One-off Steel Wheels. The Custom four Link Suspension and Massive Coilover Shocks try their best to keep the paddles planted firmly on the ground but as you can see from the videos this thing is a wheelie machine. 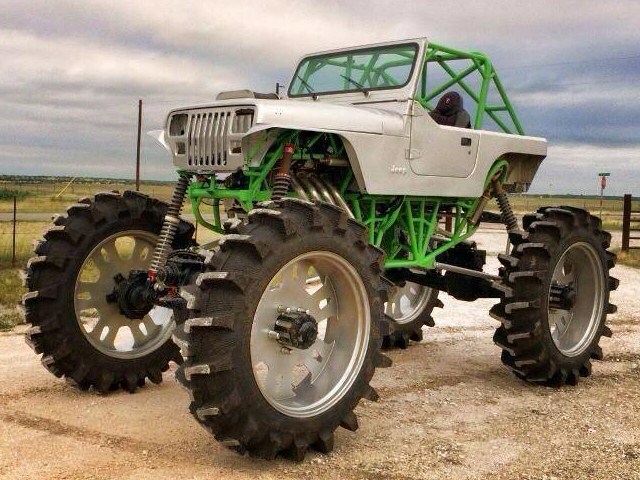 The insane combination of monster horsepower and bulletproof parts list allow this mud jeep to send mud into orbit everytime the he hits the throttle. Kenny lives in Texas and is not afraid of the skinny pedal by any means. We caught this Mud Jeep doing Mud Wheelies at Mud Truck Madness in Louisiana and some Tug of War Action later on. Check out all of our videos over on the Busted Knuckle Video Youtube Channel.